Bet Falcons +3.5 over Saints at Karamba. Bet Giants +6 over Texans at Karamba. Bet Dolphins -3 over Raiders at Karamba. Bet 49ers +6.5 over Chiefs at Karamba. The Week 3 landscape presents a mixture of challenges and opportunities for NFL betting fans. There are a number of intriguing games, including the New Orleans Saints-Atlanta Falcons first-place showdown in the NFC South, the New York Giants and Houston Texans trying to avoid 0-3 holes, and the San Francisco 49ers and Kansas City Chiefs presenting us with a battle of two burgeoning quarterbacks. Here’s a look at this week’s best NFL picks against the spread. The Falcons got healthy at home in Week 2 as Matt Ryan played a lot better than he did in a painful Week 1 performance against the defending Super Bowl champion Philadelphia Eagles. Does this mean Ryan is permanently back on track, though? It remains to be seen. New Orleans has played two home games and now goes on the road for the first time this season. The Saints have looked very shaky and had to work really hard to get past the Cleveland Browns. Maybe the Saints are an average team, but with Drew Brees it seems hard to believe that they will remain ordinary on a consistent basis. They have plenty of talent on both sides of the ball. While this is a road game for them, it isn’t too daunting as the two teams have split the last 26 meetings in Atlanta. The Falcons have some injuries piling up with running back Devonta Freeman out and now guard Andy Levitre out for the season. Along with safety Keanu Neal and linebacker Deion Jones out for the year, that’s a lot of talent absent on this roster. Look for the Saints to put up a strong effort and at least cover. We’ll take the Falcons +3.5 at Karamba. The Giants’ terrible performance on Sunday Night Football against the Dallas Cowboys showed that while the Giants picked a running back at No. 2 in the 2018 Draft, and while they hoped that Eli Manning throwing passes to Odell Beckham could lift their offense back to the standards of the recent past, they neglected the one thing they always needed but have rarely had since their Super Bowl championship early this decade: a solid offensive line. The Giants line is a mess, as it was in 2017. At the same time, the Texans offensive line is equally pathetic. They’ve made their first two opponents look great. The New England Patriots couldn’t get a sack against Jacksonville but they had four against the Texans. And while the Titans registered just one sack and two quarterback hits on the Miami Dolphins, they had four sacks and 10 quarterback hits on the Texans. This is a battle of 0-2 teams and the Texans are laying too many points here. Take the Giants and the points at Karamba. The Oakland Raiders are a hard bunch to figure out. They’ve led in both of their first two games of the season but they’ve also been outscored 43-7 after halftime so far. Quarterback Derek Carr has completed 80.6 percent of his passes so far and has thrown for at least 288 yards in each game, but anyone who has watched knows those numbers are misleading. He’s been throwing a lot of short, quick passes and has looked scared in the pocket. He has just one touchdown and three interceptions so far. And while the Raiders have been close, now they are in a tough spot. After playing at home in Oakland on the opening Monday Night Football, they traveled to the altitude in Denver and lost, and now have to fly across the country to Miami. And it won’t help that the Dolphins are very quietly 2-0 and have played quality ball so far. Lay the points with Miami here at Karamba. 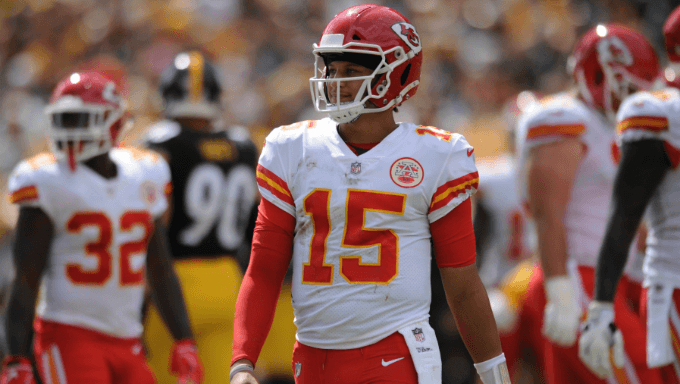 The Chiefs and young quarterback Patrick Mahomes are off to a blazing start and have been undeniably impressive. However, the music is going to stop and the party is going to end for Mahomes at some point. A young and unproven quarterback will have a rough game at some point, and with Richard Sherman of the 49ers saying that his team’s Week 2 win over Detroit felt like a loss, San Francisco – which played a good Minnesota team close on the road in Week 1 – can take the next step and take down the Chiefs in Missouri. It’s a weird spot for the Chiefs as they were underdogs in their first two games. Now as a favorite and now at home, they are expected to win. Look for the 49ers to keep this inside of a touchdown. Bet San Francisco and take the 6.5 points at Karamba.